Positive thinking in the workplace is extremely important for career builder newbies in order to turn in work that goes beyond expectations. Positive thinking is a mental attitude. What we think affects how we behave. It is therefore important for us to begin with our thoughts. One cannot pay lip service to positive thinking. You need to practice and make positive thinking your prevailing attitude towards life. This will transfer towards positive thinking in the workplace. So, how do you make it a prevailing attitude? Entertain positive thoughts. It takes as much effort to think about the negative as it is for the positive. Concentrate on the positive and expect a positive result. Associate with colleagues with a positive attitude. Read inspiring quotes. These are simple ways to create a habit of positive thinking in the workplace. Positive thinking in the workplace is solutions thinking. When a project goes bad and not in the desired direction - a positive thinking person concentrates on solutions instead of the problem. Ever noticed some colleagues have a natural tendency to point fingers when things do not go right? They tend to whine and complain instead of starting to work on a solution immediately? Positive thinkers live up to the challenge of the problem and commit themselves to seeking a solution to the problem. They do not dwell in unproductive activities. 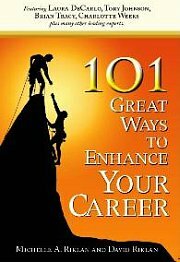 As a career builder newbie, you will probably get new assignments that you may not be familiar with. How many times have you thought – “Oh no, I am never ever able to do this.” When that happens, you end up dwelling on it and wasting precious time. Positive thinking in the work place involves thinking in these words – “I can”, ”I will”, "I am able”, "I am ready". It also involves taking the initiative to seek answers and solutions. And to be proactive in learning about the information needed to complete the assignment at hand. A positive thinker in the workplace concentrates on the assignment and is not distracted by negative thoughts. Is positive thinking in the workplace easy? Well, it is as easy as you want it to be. It is also as difficult as you expect it to be. There will be times when you cannot help but feel negative. When such feelings arise, remind yourself it is as easy to look for a positive angle to things as it is for a negative angle. How can you stay motivated at work and keeping going? Try these steps. Feeling trapped at work can drive down your motivation considerably. Are there things you can do to make the situation better? How do you do things you don’t like? I think we have all been brainwashed to believe we need to be inspired to do things. Otherwise, it feels forced. Here are my tips on how you can do things you don’t like. Forcing inspiration to appear, so to speak. Do you tend to stray and end up doing less than you want at work? Here's 7 ways to guide you to stay focused effectively. How do you become highly motivated in your job? Especially when you feel lost in your day-to-day chores? If you learn from failure then it’s OK to fail because you will find better ways to succeed. It’s only Sunday and you dread going to work already. How do you deal with the situation? How do you handle your workplace problems? Is there a simple way? What else can you do when you want to give up? After working so hard, you feel that you're still stagnant and need a career boost. What are some things you can do to get motivated and get excited about work again? You feel you have lost your direction at work, and you do not know what to do anymore. You seem to have lost that kick that used to keep you going. What do you do? 7 tips and ideas to make today the best day at work. Creating your dream job as opposed to finding your dream job. Is it possible? A compilation of over 150 positive motivational quotes about work to encourage and empower you. In order to turn in work that goes beyond expectations, postive thinking at work is necessary for career builder newbies.